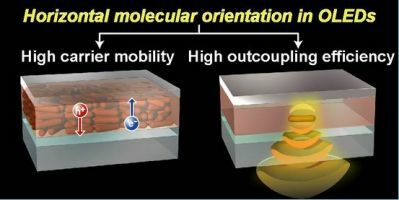 Prof. Daisuke Yokoyama from the Yamagata University in Japan published an interesting research paper about molecular orientation in small-molecule OLEDs. Daisuke says that orienting the molecules horizontally has two positive effects: the light outcoupling efficiency is increased (by around 50% compared to randomly oriented emitters) and the charge transport between molecules becomes more efficient (which can lead to a lower driving voltage). Daisuke tells us that some materials in commercial OLEDs are already horizontally oriented - but not all. He claims that most phosphorescent emitters are not horizontally oriented yet. If so, we can expect good performance increases once these materials are oriented.